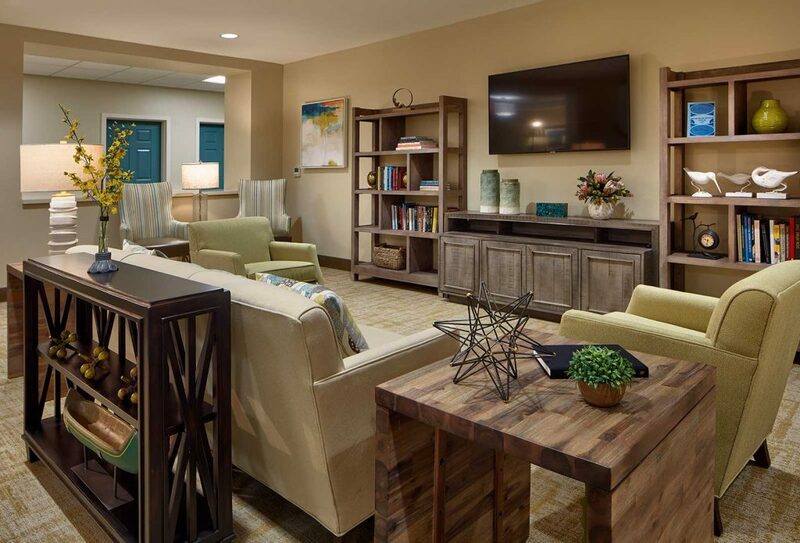 We’re speaking with WDA senior living interior designer Karyn Jacobs about a successful project recently completed near San Diego, California. 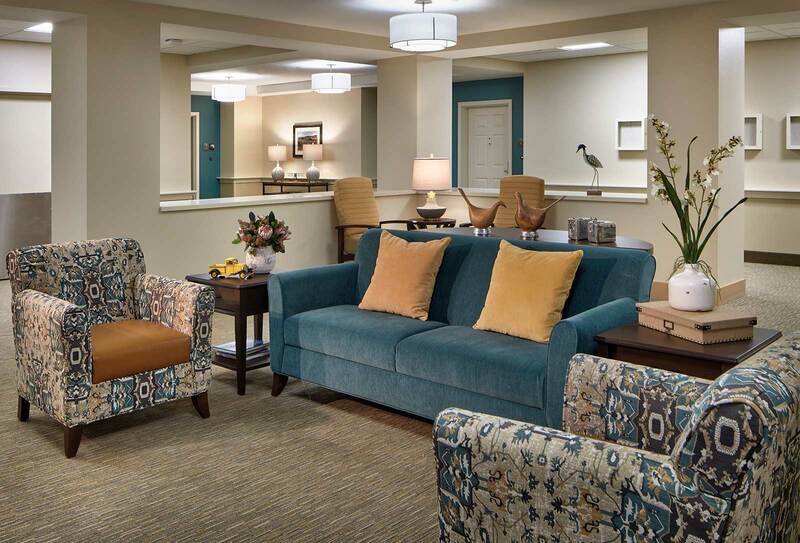 In a few questions, she walks us through the project and the senior living interior design strategy behind it. Check out our interview and photos below! Give us a high-level overview of the project. 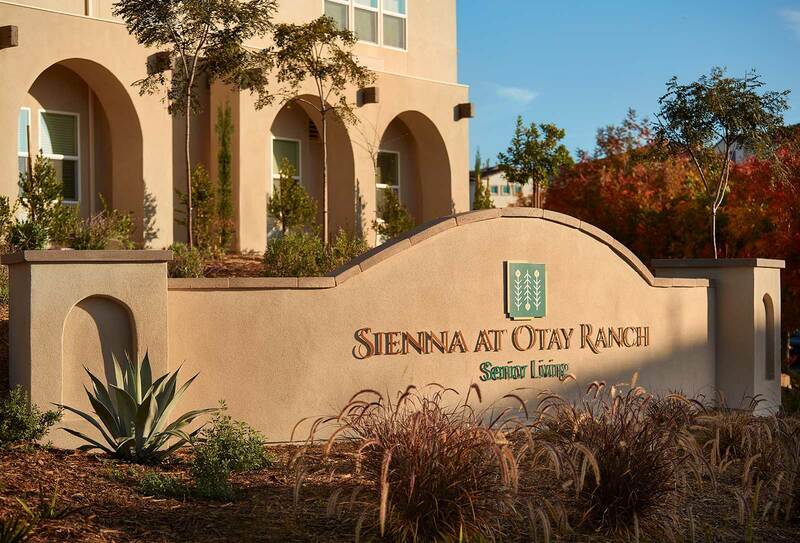 Sienna at Otay Ranch provides Assisted Living, Memory Care, and Respite Care options in Chula Vista, California – which is just south of San Diego. 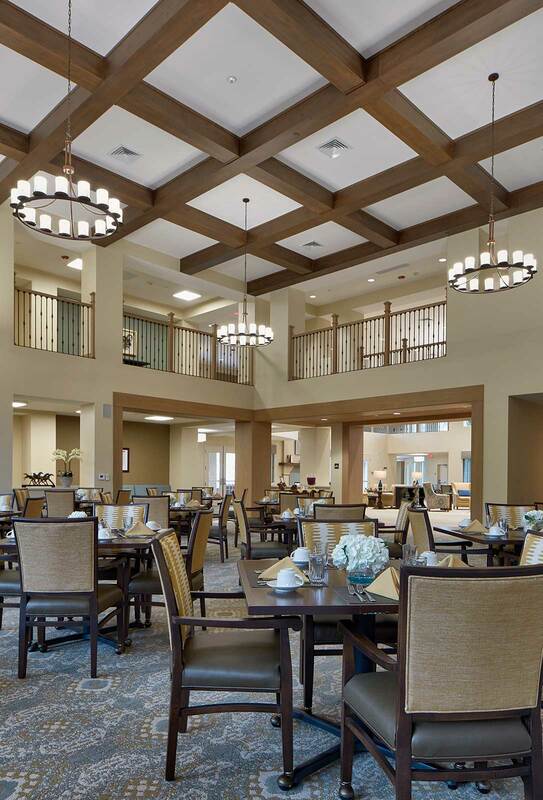 It’s a new build, and the first senior living project for Douglas Wilson Companies, so one of our main goals was to guide DWC through the design and programming of senior living facilities through WDA’s 27 years of experience. It’s exciting to see that they’re now working to secure land for a few more upcoming buildings! 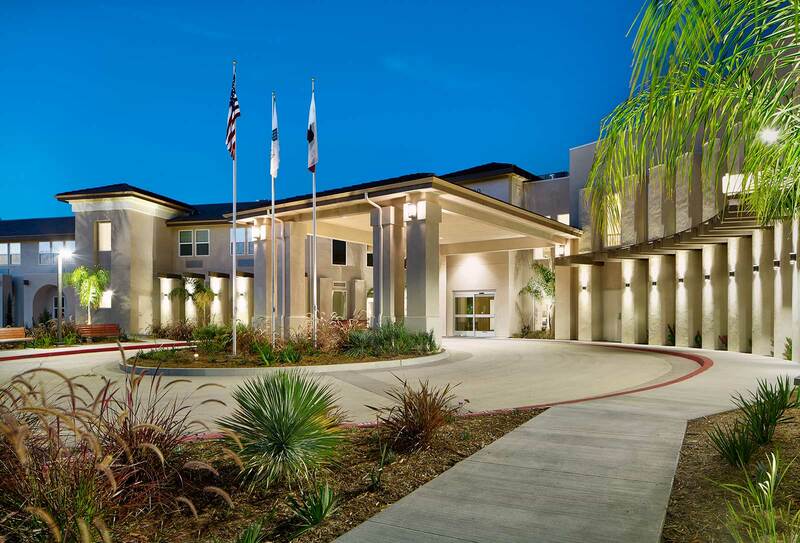 Milestone Retirement, the other owner (and the operator), has communities across the country and they encourage communities to operate independently with their residents and local culture in mind. 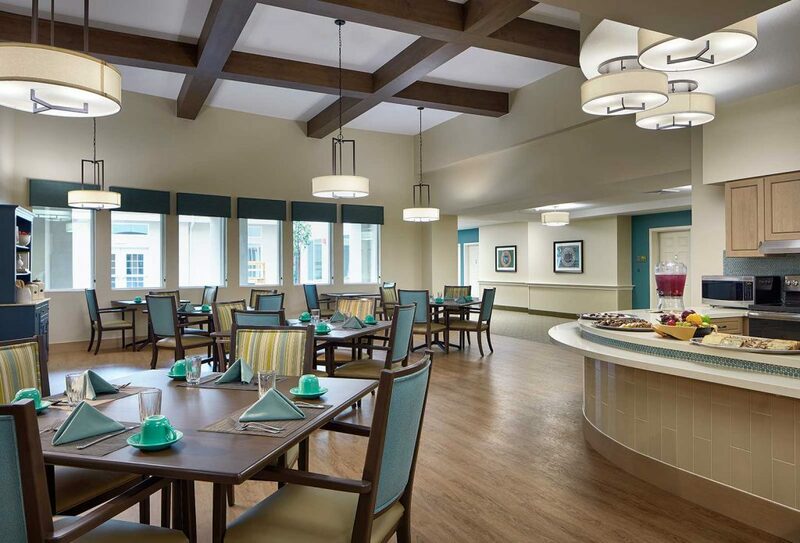 Geography and culture always play a prominent role in our design strategy, so from the start that was a natural fit when Caitlyn Webb (previous WDA employee who recently moved to New Hampshire with her fiance) and I worked on this project. What was your design inspiration & themes? Walk us through the thought process. Given the importance of incorporating the local culture, we wanted to create a design that felt natural to the area. 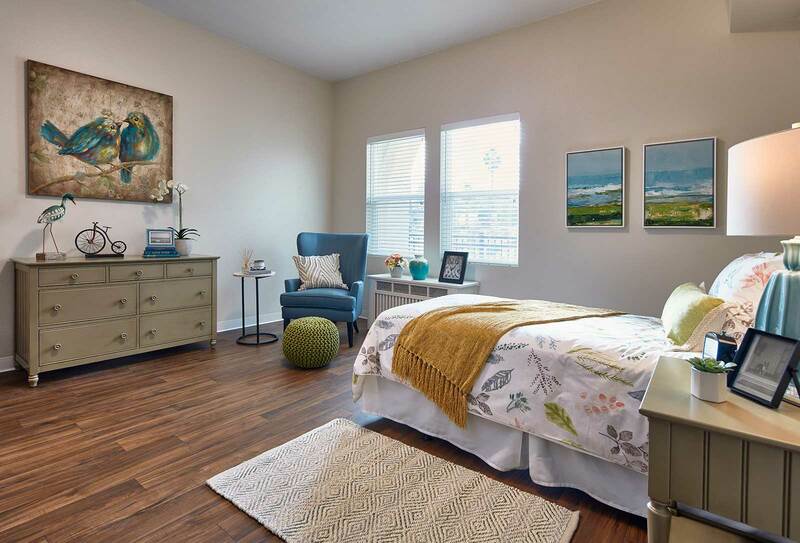 We imagined a contemporary mission design with eclectic materials, cultural references, and pops of color (such as teals or orange tones) set against a neutral background. All in all, we aimed to reflect a refined yet casual Southern California lifestyle. Any key elements that helped bring this design concept to life? Absolutely. We incorporated light, textured walls that would be reminiscent of stucco; wood-looking materials, including ceiling details, in first impression areas; contract-grade fabrics with a natural look and feel such as linen and cotton; and eclectic and colorful accessories that reflect a Latin heritage. The color combinations were derived from Southern California and Latin America’s geography & culture. The cool tones may come from beach waves or succulent, and the warm tones from the desert rocks, poppy flowers (California’s state flower), and glowing sun. 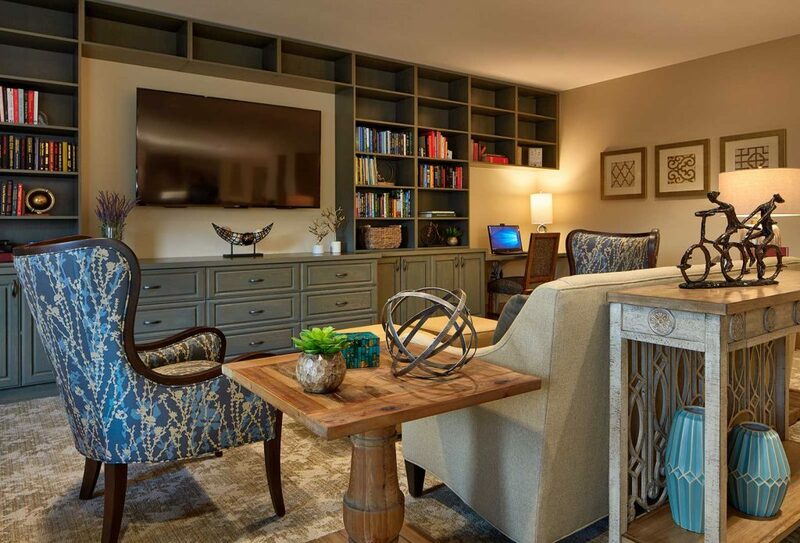 What did you want to achieve with your furniture selections? 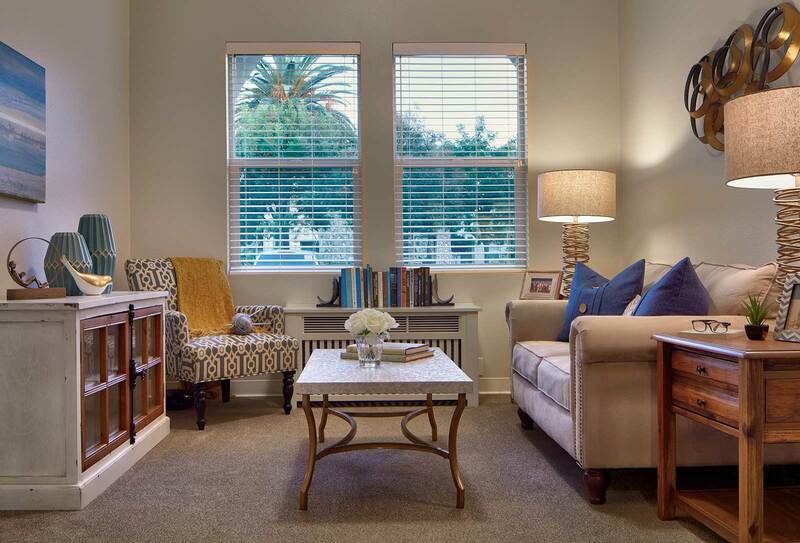 When most people think of interior design, they think of colors and decor. But programming is an important part of interior design! How did you consider factors like programming in your strategy? 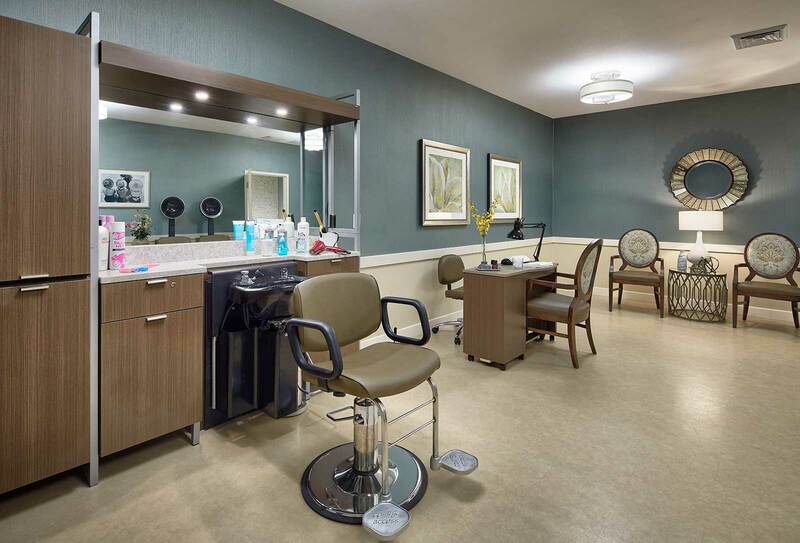 Providing a wide array of amenity spaces was of high importance to the owner and operator. 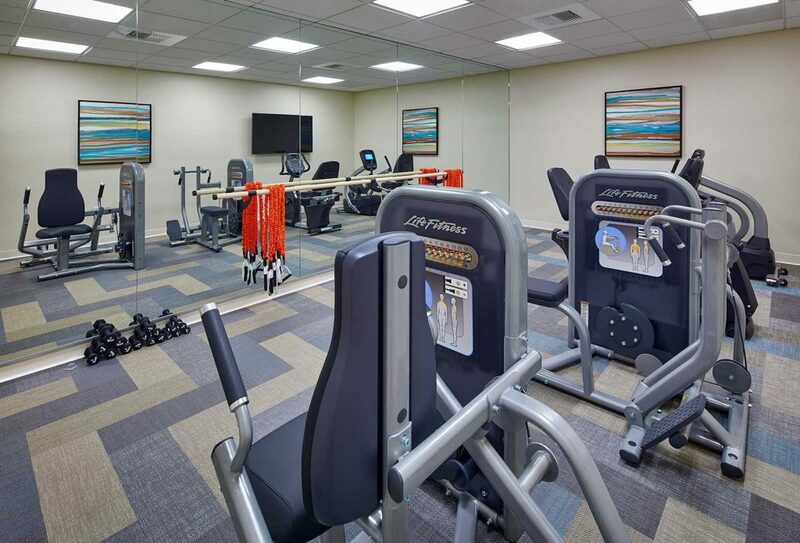 These spaces included a salon, spa, private theater, fitness center, and activity room. It took a lot of coordination between WDA and the Architect to fit that many defined spaces into the building without infringing on resident units, but we believe these spaces are what create engagement and a sense of community among the residents. Also – the size of the Main Dining Room was very successful. 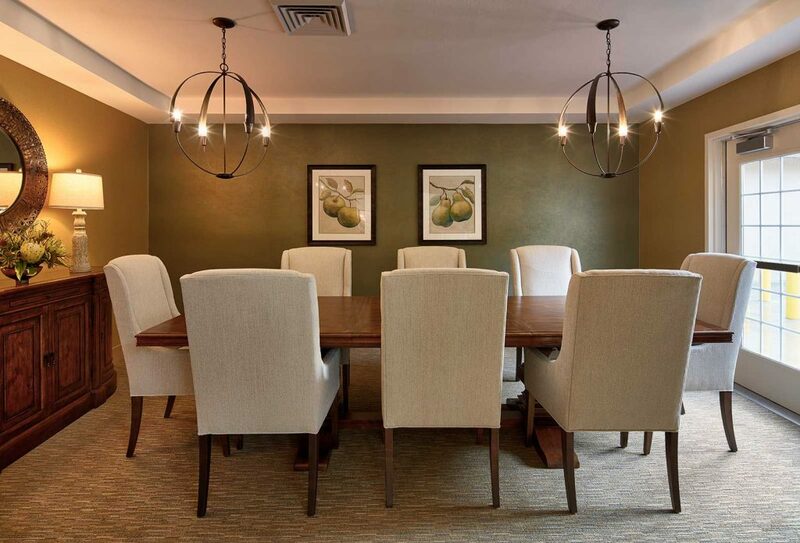 Many dining rooms we work on are smaller in size, and it’s a struggle to fit enough seats while also ensuring there’s enough space and accessibility for a safe and effective design. Here, we were able to work with plenty of space around the tables without feeling over-crowded, which also gave us a little more flexibility in our design. What’s one of your favorite little design details? I loved the persimmon colored chairs in the theater! 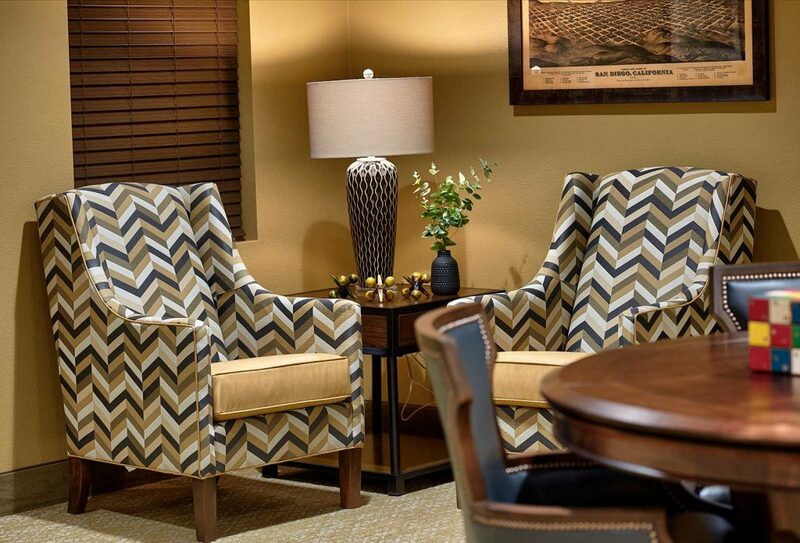 For a small room, the chairs brought in a fun look and really gave the room its own character. Also, in Memory Care, I created a collage of historic Chula Vista and Otay Ranch imagery. 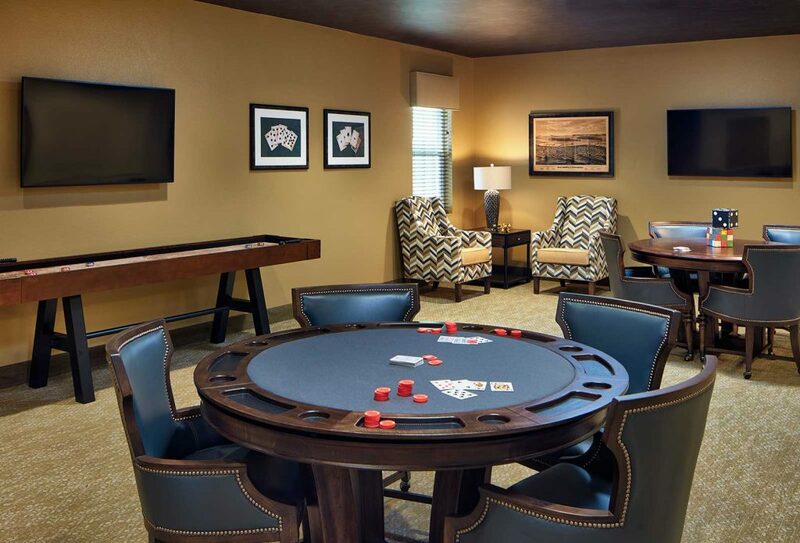 It was fun to look through the photo archives and create a spot for residents to look at images from their past! 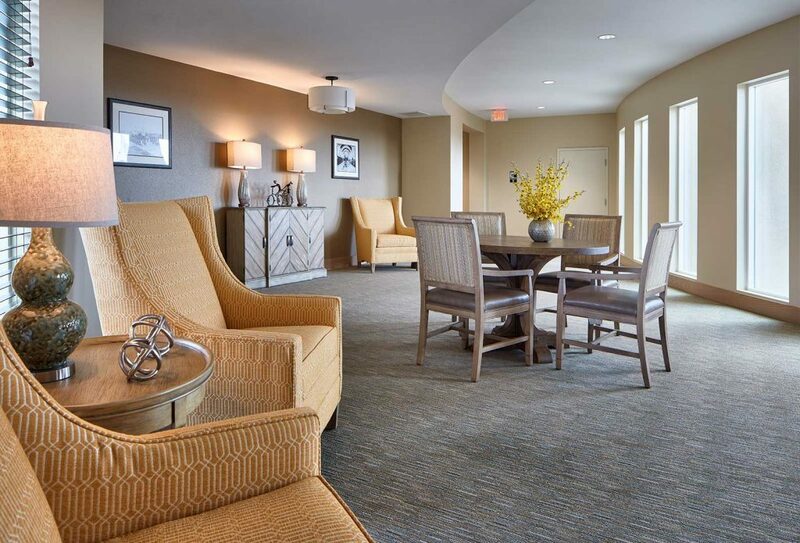 Have you heard any feedback from the residents? Yes! One piece of artwork is a photograph of Casa del Prado Theater in Balboa Park. There is a resident who actually worked on that building (as an architect or engineer), and when he moved in he requested that his sign have that image on it as a remembrance from his working days! Little things like that are what make this job great.